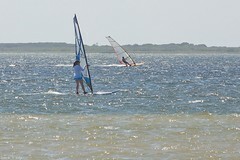 The first windsurfing trip of the year was a blast. Jason, Julie, Janet, Mo, and I had a great time. Let's do it again. The second trip of the year is May 7th - 9th in Corpus Christi. I'll be staying at the Ikea-styled Motel 6 near the island again, but you can stay where you like. The Motel 6 isn't luxury, but it does bring back fond memories of dorm living. This time you don't have to worry about the RA catching you with beer in your room. Just try to keep it down when you demo your sail flip to us at 2 am. As always, Worldwinds will be hosting the beginners and the renters. They treat us like family, but be sure to get your reservations for classes and gear in early. If you decide to come, you'll want to follow the 5 magically easy steps to prepare for the trip.